Temple B700 at Jebel Barkal, dedicated to Amun, was constructed beside and just to the west of Temple B600 (see the Site History for a site plan) about 650 BCE by two Kushite kings about whom little is known: Atlanersa (650-640 BCE), who died when the temple was only partly finished, and Senkamanisken (640-620 BCE), who completed the work. These kings were the two immediate successors of the last Kushite pharaohs of Egypt, and thus the temple is clearly Egyptian in its architectural and decorative styles. 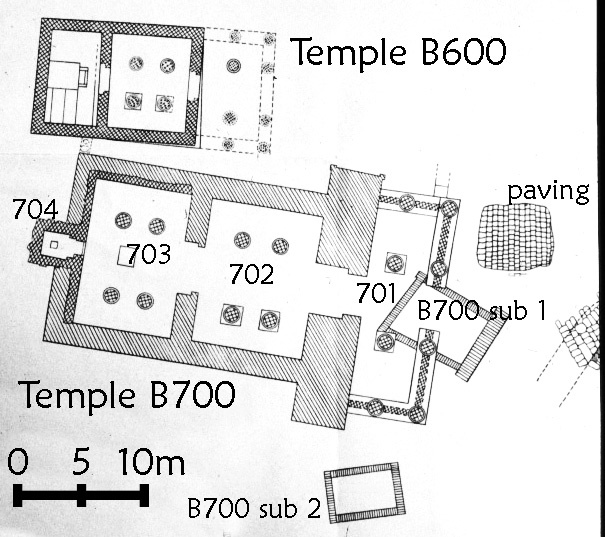 B700 is quite small, only about 20 X 33m, comprising a porch, pylon, two main inner rooms, and a small space added to the back possibly in the first century BCE after a major rock fall destroyed the rear spaces. (at Napata), Amun of Kawa, Amun of Pnubs, and Dedwen of Semna. The temple was first excavated between February and April, 1916, by George Reisner and his team from the Museum of Fine Arts, Boston, and again between March and April, 1987, by the new Boston team led by Timothy Kendall. 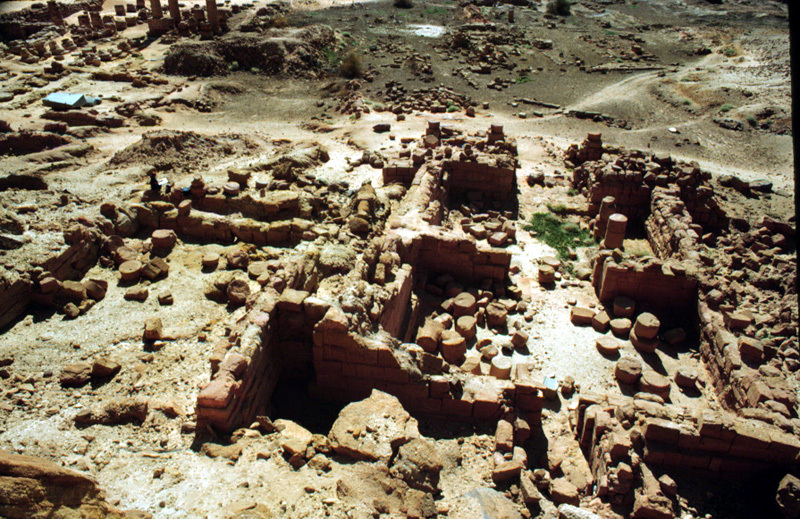 In 1989, Kendall and his staff resurveyed the monument (the image at the left shows the temple remains from the rear; image courtesy of Timothy Kendall; hover over to enlarge). 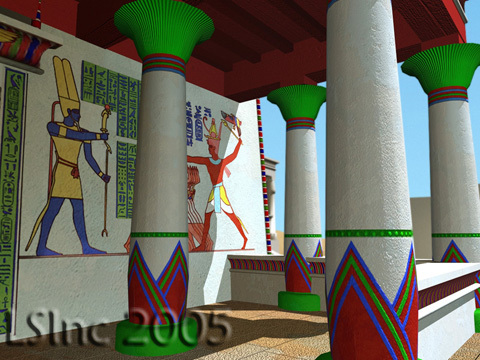 Although little remains today of the temple's wall carvings and inscriptions, the surviving evidence, excavation notes, and 19th-century drawings of the temple's pylon have enabled us to reconstruct the images and much of the building's narrative program (the rendering at the left shows how we depicted the temple in 2005, with the inset showing a 19th-century drawing of the pylon; hover over to enlarge). 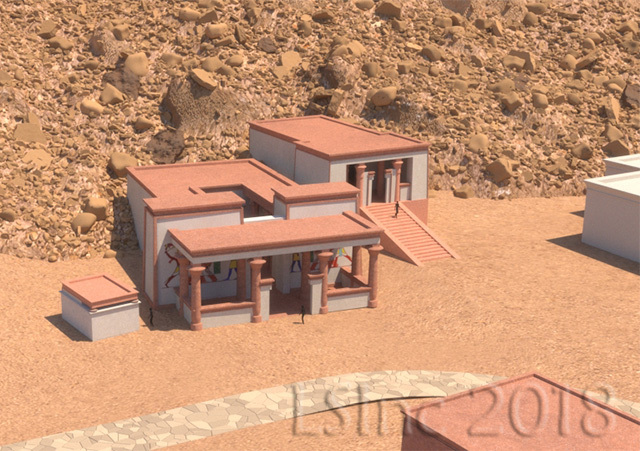 During 2015, LEARNING SITES began a final 3D computer model of Temple B700 (aerial view of B700 and B600 at left; hover over to enlarge) based on a new evaluation of the evidence and new photomodeling of the site, jebel, and temple contexts, under the direction of Timothy Kendall (as part of the Qatar-Sudan Archaeological Project). This updated version will be part of a comprehensive virtual world research resource and digital publication of the entire site, built using the Unity game engine and WebGL, which will debut here as aspects of the world become finalized. An earlier version of the temple was created in 2005 (see a detail of the pylon porch at the left; hover over to enlarge). 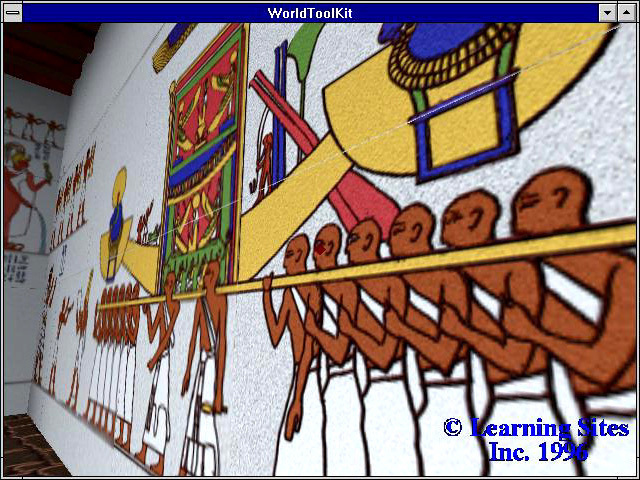 LEARNING SITES worked closely with Egyptologists to ensure the integrity of the resulting visualization. Under the leadership of Timothy Kendall, analyses of the hieroglyphics have provided clues to the function of this small religious structure. However, whether the building was originally planned as temple to deceased kings or whether its function was established only following the premature death of Atlanersa remains uncertain. 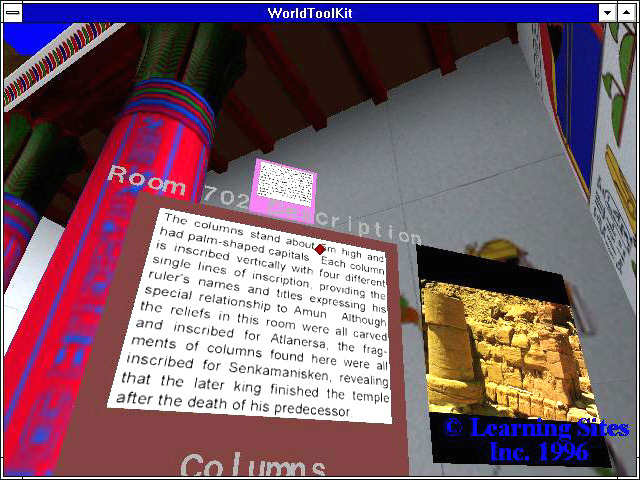 Developed in the Fall of 1995, the original virtual world of Temple B700 already featured many of the elements that make LEARNING SITES digital educational, research, and publication products unique: reconstructions in stunning detail (see the detail from the 1995 model at the left, part of the wall decoration in room B702; hover over the image to enlarge); painstaking archaeological accuracy; interactive supplemental in-world text, image, and (in systems supporting sound) narration databases linked to objects throughout the virtual environment; and hierarchically nested datasets for browsing, researching, and learning about Jebel Barkal and Temple B700. Originally, this early virtual world was available from LEARNING SITES, for museum exhibits, research, or coursework (the image at the left from the 1995 virtual environment shows the in-world access to informational panels keyed to objects throughout the model; hover over the image to enlarge). That Jebel Barkal Temple B700 module came in two versions (the world could have been viewed with or without immersive head-mounted or boom-mounted displays): (1) For Windows NT, 64Mbytes of RAM (128Mb recommended), 150Mb of available hard drive space, OpenGL graphics accelerator, and Sense8 Corporation's, WorldToolKit (version 2.1); and (2) For Silicon Graphics Incorporated Onyx workstations with a Reality Engine 2, IRIX operating system version 5.3 or higher, and 150Mb of available hard drive space, and Sense8 Corporation's, WorldToolKit (version 2.1). We thank Intergraph Corp., Silicon Graphics Corp., and Sense8 Corp. for their assistance and participation during the development of this pioneering virtual world. 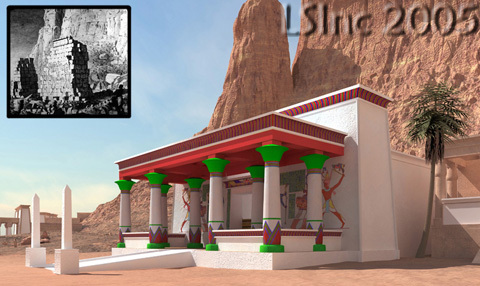 Original archaeological reconstruction by Timothy Kendall and Donald H. Sanders; model by Eben Gay, Edward Hill, and Richard Morse; virtual reality programming by Eben Gay and Oren Levine (the distant view of B700 at the left is also from the 1995 virtual world; hover over to enlarge). 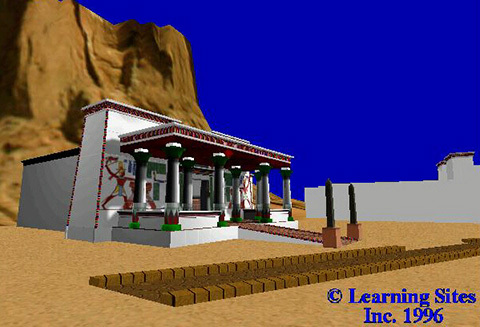 In 1990, the first 3D computer model of the temple was created by Bill Riseman working with curators at the Museum of Fine Arts, Boston, under the direction of Timothy Kendall. At the left is a rendering of the pylon of B700 from that model (hover over to enlarge). 1907 The Egyptian Sudan: Its History and Monuments. London, especially Vol. I, pp.139-43. nd Description of details of Temple B700 in a notebook now in the British Library, London (Burton Ms. 25651, 7 [top], 68 [top]). 1826 Voyage à Meroé, au fleuve blanc.... Paris, especially Vol. II, pp.41-43 and Vol. III, pp.216-18. 1826 A Narrative of the Expedition to Dongola and Sennar.... Paris. 1929 "Scenes from a Destroyed Temple at Napata," Journal of Egyptian Archaeology 15:26-28 (Lord Prudhoe Ms. Atlas (A) folio 37 (a), Alnwick Castle). 1835 Travels in Ethiopia.... London, especially pp.140-41, pls.23, 25 (background). 1987 "Gebel Barkal Epigraphic Survey: 1987. Summary of Second Season's Activities of the Boston Museum of Fine Arts Sudan Mission," Nubian Letters 9:7-10. 1853 Letters from Egypt, Ethiopia, and the Peninsula of Sinai. London, especially pp.18, 220, 222, and frontispiece. 1849-59 Denkmaeler aus Aegypten und Aethiopien. Berlin, especially Abt. I, Bl. 126. 1958 Journal d'un voyage à Meroé dans les anneés 1821 et 1822. M. Shinnie, ed. Sudan Antiquities Service Occasional Papers #4. Khartoum, especially p.49 (Bankes Ms #xv A 26, 27, and xv C 8). Lowell, John Description of Temple B700 in the Lowell Diaries, now stored in the Museum of Fine Arts, Boston (Journal 6, part 2). 1931 "Inscribed Monuments from Gebel Barkal," Zeitschrift für Ägyptische Sprache und Altertumskunde 6:76-100. 1829 Reisen in Nubien, Kordofan, und dem peträischen Arabien. Frankfurt am Main. 1822 Journal of a Visit to Some Parts of Ethiopia. London, especially pp.166-67.